In the comments to my last post describing Cau's (2018) new paper detailing the acquisition of characters on the line to Aves, reader AOF requested a post similar to what I did six years ago with the Carrano et al. (2012) tetanurine analysis. Namely, testing alternative topologies using constraint analyses to see how many more steps they would require. I think these kinds of things can be illuminating. I've often said that we shouldn't think of a new cladogram as just 'the best new hypothesis', but rather check individual components of the tree to see how likely or unlikely they are to be correct. Cau's 2018 matrix has a reduced taxon sample, which could easily change the number of steps compared to a complete sample. On the other hand, I think Andrea tries to include all proposed characters in his MegaMatrix, which could make this a more honest measure of comparative topology length than most studies. I'm not sure which variable overrides the other. Then we have score correctness, which I've never checked in a Cau matrix, so I'm taking that at face value. Andrea sent me his NEXUS file, but whereas the paper reports 3072 MPTs of 6790 steps, I found 10872 MPTs of that length. Eoraptor and Buriolestes aren't always sauropodomorphs, Pisanosaurus is sometimes an ornithischian, Asilisaurus, Silesaurus and Sacisaurus are an unresolved trichotomy, Enantiornithes can be paraphyletic with Zhongjianornis among them, and Fake Ornithuromorpha is less resolved, as Patagopteryx and Apsaravis can be outside Hongshanornis+Aves, Archaeornithura can be a songlingornithid, etc.. I think Andrea's philosophy would be that these things vary with taxon inclusion, so aren't a definite part of his data. The absence of any included spinosaurids, carcharodontosaurines, parvicursorines or Avimimus unfortunately makes some weird 80s and 90s hypotheses untestable. After six more years of experience, I've added a new category "less likely" because I think that factors like scoring accuracy and taxon inclusion can have a larger influence. As I said in the 2012 post, the corrected TWG matrix needed 15 more steps to get a monophyletic Deinonychosauria which is the most common outcome for TWG matrices today. I'll say the Lori matrix recovers at least one hypothesis found to be "unlikely" here, so even that's not the kiss of death. 1 step- Ceratosaurus closer to abelisauroids than Elaphrosaurus. 1 step- Coelurosaurian Zuolong. Ends up as a basal maniraptoromorph between Coelurus and Ornitholestes. 1 step- Coelurid Aorun, as in its original description. It moves to Maniraptoromorpha with Coelurus. 1 step- Coelurid Tanycolagreus, as in its original description. Coelurus moves into Tyrannosauroidea with Tanycolagreus. 1 step- Compsognathid Sinosauropteryx and/or Sinocalliopteryx. 1 step- Tyrannosauroid Sinocalliopteryx or Coelurus. 1 step- Anchiornithid or archaeopterygid Xiaotingia. 1 step- Scansoriopterygids closer to Aves than Archaeopteryx. 1 step- Sapeornis closer to Aves than Confuciusornis. 1 step- Zhongjianornis sister to Pygostylia, as in its original description. 1 step- Ichthyornis closer to Aves than Hesperornis, the consensus until the recent cranial redescription of Ichthyornis. 2 steps- Chilesaurus just outside Avepoda, which was my best guess back in 2015 considering the results of its original misscored matrices and my subjective feelings of what would plausibly reverse. 2 steps- Ceratosaurian Gualicho. It has an uncertain placement within the clade, though is excluded from Abelisauria. 2 steps- Megaraptora as coelurosaurs just outside of Tyrannoraptora. This was my result back in 2010 after adding Benson's Neovenatoridae data to my theropod supermatrix (since superseded by the Lori analysis). Bicentenaria is at this level too, while Guanlong and Tanycolagreus become maniraptoromorphs. 2 steps- Hongshanornithid Parahongshanornis, as in its original description. 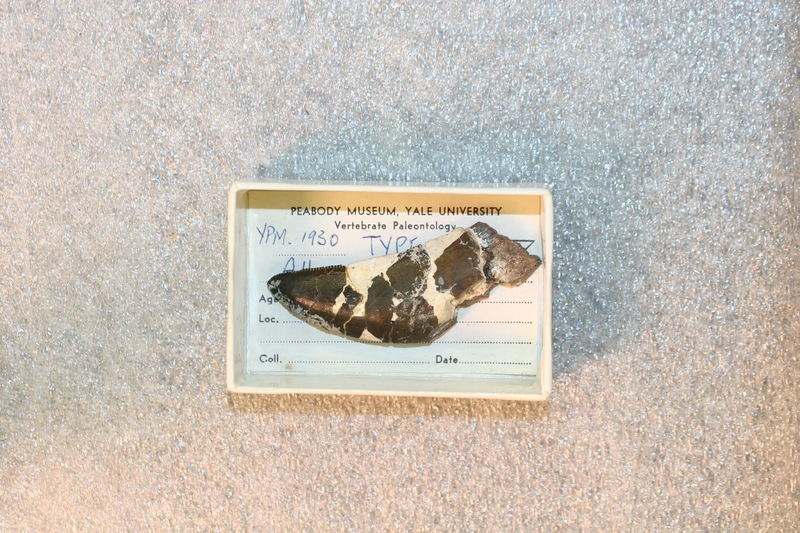 Cast YPM 56693 of the Mononykus olecranus holotype pes in plantar view, courtesy of Senter. 3 steps- Saurischia. Herrerasaurs and Eodromaeus are theropods. Note that while some of these constraints were tested in the Ornithoscelida paper, the studies differ in both taxonomic content and characters used, so that MegaMatrix results don't necessarily correlate with Ornithoscelida paper results and should not be seen as scooping anything we find. 3 steps- Ornithischian Daemonosaurus. Chilesaurus is sister to Averostra. 3 steps- Theropodan Herrerasaurus/Tawa/Daemonosaurus. These each take three steps more, and other herrerasaurs follow when one is constrained. 3 steps- Dilophosaurid Liliensternus, as in Paul (1988). 3 steps- Ceratosauria sensu lato, combining Neoceratosauria and Coelophysoidea. Chilesaurus is the most basal theropod, Elaphrosaurus plus Limusaurus are the basal neoceratosaurs, and Gualicho is the most basal tetanurine. 3 steps- Eustreptospondylus and/or Megalosaurus outside Avetheropoda. If one is constrained, the other follows. 3 steps- Megaraptoran Eotyrannus, as in Novas et al. (2013). 3 steps- Troodontid Aurornis, Anchiornis and/or Xiaotingia. 3 steps- Chongmingia sister to Ornithothoraces, as in p2 of its original description. 4 steps- Ornithischian silesaurids. Lewisuchus is outside Dinosauria, Saurischia exists, and Asilisaurus and Pisanosaurus form a silesaur grade to either side of Silesauridae. 4 steps- Phytodinosauria. Eoraptor and Buriolestes are sister to Dinosauria, while herrerasaurs and Eodromaeus are theropods. 4 steps- Ornithischian Chilesaurus. Ornithoscelida occurs. 4 steps- Theropodan Eoraptor. Buriolestes, herrerasaurs and Eodromaeus also theropods. 4 steps- Abelisaurid Eoabelisaurus, as in its original description. 4 steps- Metriacanthosaurids outside Allosauria (Allosaurus plus Carcharodontosaurus). Acrocanthosaurus joins Neovenator, so this also covers carcharodontosaurid Neovenator. 4 steps- Tyrannosauroid Compsognathus, as in Olshevsky (1991). Surprised this one is so parsimonious. A Compsognathidae with Aorun, Bicentenaria and Sinosauropteryx are the basalmost tyrannosauroids, with Sinocalliopteryx, Coeluridae including Tanycolagreus and Guanlong successively closer to core tyrannosauroids. 4 steps- Maniraptoromorph Tanycolagreus and/or Guanlong. 4 steps- Ornithomimosaurian Gualicho. Tested due to Rauhut (2003) finding the very similar Deltadromeus in this position. Note that ornithomimosaurian Elaphrosaurus is 36 steps longer, so the cases aren't that similar. 4 steps- Archaeopterygid Jinfengopteryx, as in its original description. 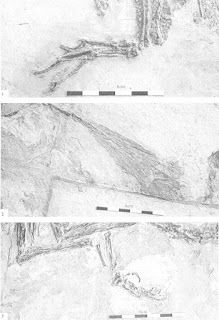 4 steps- Oviraptorosaurian scansoriopterygids. They have an uncertain position within the clade, and therizinosaurs are still sister to oviraptorosaurs. Allosaurus fragilis holotype tooth (YPM 1930) in ?lingual view. Courtesy of the YPM. 5 steps- Dilophosaurus/Cryolophosaurus closer to Averostra than Coelophysis. 5 steps- Non-avetheropod Compsognathus, as in Novas (1992). Very surprised this is so easy to get. It's even more extreme than Novas' version, where Compsognathus was at least closer to avetheropods (his Tetanurae) than Piatnitzkysaurus and Eustreptospondylus, because in the constrained trees Carnosauria still has the same content as Cau's MPTs. Sinosauropteryx joins it. 5 steps- Maniraptoromorph Eotyrannus. I'm surprised by this, since I figured the result in other matrices was due to a lack of tyrannosauroid characters, which I think are all in the MegaMatrix. 5 steps- Non-tyrannoraptoran Coelurus, as in Paul (1988). 5 steps- Avemetatarsalian alvarezsauroids, as in Sereno (1999). Jianchangosaurus is still a basal alvarezsauroid. 5 steps- Haplocheirus compsognathid/coelurid grade, as in Alifanov and Saveliev (2011). Wasn't there some analysis that recovered it here too? I just constrained it to be outside Maniraptoriformes (including alvarezsaurids). 5 steps- Non-pennaraptoran therizinosaurs, which fall out sister to Pennaraptora like the current consensus. 5 steps- Chongmingia a basal ornithurine (sensu Gauthier) outside Shenzhouraptor and Pygostylia, as in p1 of its original description. The Lori analysis recovers it in a different position than p1, p2 or Cau's analysis. 6 steps- Non-eusaurischian saurischian Eoraptor. Buriolestes follows, but herrerasaurs and Eodromaeus are theropods. 6 steps- Theropodan Guaibasaurus. Non-dinosaurian Eoraptor and Buriolestes, and this recovers Phytodinosauria. 6 steps- Eustreptospondylus closer to Neotetanurae than Megalosaurus, as in Holtz (2000). I'm actually surprised this is so unlikely. 6 steps- Carnosaurian Sinosauropteryx, as in Longrich (2002). Though Longrich's phylogeny was a bit different in having megalosaurids and metriacanthosaurids outside Avetheropoda. 6 steps- Ornithomimosaurian Haplocheirus, as in the Bayesian analyses of Cau and Lee and Worthy (2011). 6 steps- Arctometatarsalian therizinosaurs, as in Sereno (1999). 6 steps- Shenzhouraptor closer to Aves than Sapeornis. 7 steps- Sauropodomorph Staurikosaurus but not Herrerasaurus, as in pachypodosaur Staurikosaurus of Kischlat (2000). 7 steps- Megalosauroid Monolophosaurus. Megalosauroidea remains in Carnosauria. 7 steps- Coelurosaurian Neovenator. Not sure if this has been suggested in print before, but I noticed quite a few coelurosaur-like characters when scoring Neovenator for the Lori matrix. It forms the most basal coelurosaur clade with Aorun and Gualicho. 7 steps- Paravian alvarezsaurids, though note the lack of parvicursorines probably affects these numbers. They (including Jianchangosaurus and Haplocheirus) emerge as the most basal paravians. 7 steps- Basal paravian Anchiornis, Aurornis, scansoriopterygids, Serikornis and/or Xiaotingia. 7 steps- Archaeopterygid Rahonavis, as in Forster et al. (1998). 7 steps- Fake-Ornithuromorphan Confuciusornis, as in Kurochkin (2006). I really thought this would be more difficult to achieve than enantiornithine Confuciusornis (below). 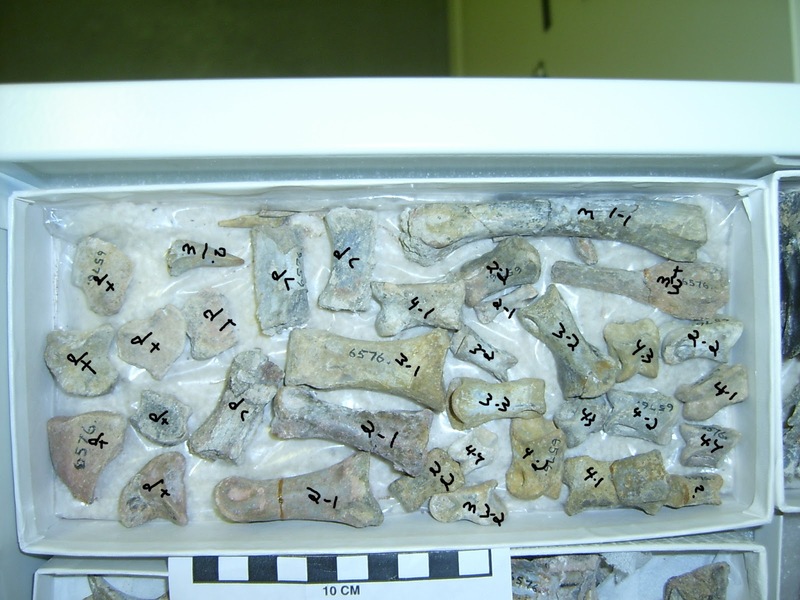 Box of Archaeornithimimus asiaticus elements from AMNH 6576, with my identifications (dc- distal caudal, dt- distal tarsal, pedal except m 1-1 and m 3-2). Is that a proximal metatarsal I in the upper left? Courtesy of the AMNH. 8 steps- Non-eusaurischian saurischian Herrerasaurus. Eodromaeus and sometimes Eoraptor become herrerasaurs and Buriolestes is one node more stemward. 8 steps- Tetanurine Cryolophosaurus, as in Carrano et al. (2002). Dilophosaurus stays in Coelophysoidea. 8 steps- Ceratosaurian megalosaurids, as in Britt (1991). Chilesaurus falls out in a polytomy with megalosaurids and other ceratosaurs. 8 steps- Megalosauroid piatnitzkysaurids, with Megalosauroidea outside Avetheropoda. Since this is the Carrano et al. consensus, I thought it would take less steps. 8 steps- Monolophosaurus sister to Avetheropoda, as in Smith et al. (2007). Megalosaurids and piatnitzkysaurids fall out as more basal tetanurines. 8 steps- Arctometatarsalian tyrannosauroids, AKA Tyrannosaurus closer to Ornithomimus than to birds as in Holtz (1994). I'm very surprised this is so parsimonious. Coelurus and Bicentenaria join Tyrannosauroidea, but Gualicho leaves to be a ceratosaur. 8 steps- Maniraptoran tyrannosauroids, as in Sereno (1999). This is accomplished more by moving ornithomimosaurs (including Gualicho) stemward to be the most basal coelurosaurs except for Zuolong. 9 steps- Classic late 80s to early 90s topology where Staurikosaurus is sister to Herrerasaurus plus Dinosauria. Tawa plus Daemonosaurus are closer to dinosaurs than both, while Sanjuansaurus follows Herrerasaurus. 9 steps- Piatnitzkysaurus outside Orionides, as in Rauhut (2003). Condorraptor follows Piatnitzkysaurus, and megalosauroids fall outside Avetheropoda. Surprised this is so high. 9 steps- Carnosaurian Tyrannosaurus, which brings megaraptorans, Gualicho and Bicentenaria to form the sister group of Allosauroidea (including Monolophosaurus). I bet this is more parsimonious than most readers would assume given published topologies over the past two decades. 9 steps- Avialan Caudipteryx, as in its original description. The rest of Oviraptorosauria follows it, though troodontids are still closer to Aves. 9 steps- Avialan Microraptor, as in Agnolin and Novas (2013). Weirdly becomes the most basal troodontid, with that family closer to Aves than scansoriopterygids and anchiornithids. 9 steps- Avialan Unenlagia, as in its original description and Agnolin and Novas (2013). Halszkaraptorines are unenlagiids, which are outside the Troodontidae plus Ornithes clade. 9 steps- Deinonychosauria. Scansoriopterygids are oviraptorosaurs, while Jinfengopteryx and anchiornithids are avialans. 9 steps- Archaeopterygidae sister to Troodontidae. Anchiornithines fall out as archaeopterygids. 10 steps- Monolophosaurus outside Orionides, as in Carrano et al. (2002). Megalosaurids and piatnitzkysaurids form successively closer outgroups to Avetheropoda. 10 steps- Fukuivenator excluded from Alvarezsauridae plus Therizinosauria plus Pennaraptora as in its original description. It emerges as the sister to other maniraptorans. 10 steps- Eumaniraptora excluding troodontids as in Agnolin and Novas (2013). Scansoriopterygids are oviraptorosaurs. 10 steps- Dromaeosaurid Xiaotingia, as in Senter et al. (2012). Falls out in Microraptoria. 10 steps- Dromaeosaurid Balaur, as in its original description. Falls out sister to Unenalagiinae plus Halszkaraptorinae. 11 steps- Tyrannosauroid Acrocanthosaurus, as in Bakker et al. (1988). Tyrannosauroids become carnosaurs, with Sinraptor, Acrocanthosaurus and Bicentenaria successively closer to the 'core tyrannosauroid' clade of Eotyrannus, Gualicho, megaraptorans and Tyrannosaurus. Tanycolagreus and Guanlong are now maniraptoromorphs. 11 steps- Alvarezsauroid Nqwebasaurus. Alvarezsauroids emerge sister to ornithomimosaurs, with Haplocheirus and Jianchangosaurus forming a basal  arctometatarsalian clade. 11 steps- Mahakala outside Unenlagiinae plus Eudromaeosauria (Halszkaraptor follows), as in most TWG matrices (though Senter et al. 2012 recovered it sister to unenlagiines like Cau). 12 steps- Alvarezsauroid Chilesaurus, where it emerged in the Lori matrix back in 2015. 12 steps- Ornithuran (sensu Gauthier) oviraptorosaurs, as in Maryanska et al. (2002). Constraining Khaan to be closer to Meleagris than Archaeopteryx results in oviraptorosaurs (including scansoriopterygids) being the first clade to diverge from the avian stem after Archaeopteryx. 12 steps- Basal paravian Jinfengopteryx, as in Foth et al. (2014). 13 steps- Coelophysoid Elaphrosaurus, as in Paul (1988). Ceratosauria sensu lato forms, Elaphrosaurus is outside core coelophysoids and Limusaurus and sometimes Gualicho follow. 13 steps- Compsognathid Nqwebasaurus, as in Novas et al. (2013). Compsognathids (including Aorun) become ornithomimosaurs. 13 steps- Dromaeosaurid Rahonavis. Emerges in the unenalgiine plus halszkaraptorine clade. 14 steps- Neovenatorid megaraptorans, though this actually moves Neovenator out of Carnosauria into Tyrannosauroidea, so isn't that similar to Benson's topology. 15 steps- Sauropodomorphan Chilesaurus, where it emerges as the most basal member. 15 steps- Carnosaurian Ceratosaurus, as in Currie (1995). Other ceratosaurs follow. 15 steps- Alvarezsaurids closer to Aves than dromaeosaurids or troodontids. Haplocheirus and Jianchangosaurus remain behind as ornithomimosaurs. Note the lack of parvicursorines probably affects this number. 15 steps- Archaeopterygid Unenlagia, as in Forster et al. (1998). Buitreraptor remains in Dromaeosauridae. Cladogram of archosauromorphs after Kischlat (2000). Note saurischian Marasuchus and sauropodomorph Staurikosaurus. 16 steps- Saurischian Marasuchus, as in Kischlat (2000). Ornithischian silesaurs result, and Lewisuchus sister to Eodromaeus plus avepods. 16 steps- Non-avetheropod Sinraptor as in Longrich (2002). Carnosauria becomes a grade, Acrocanthosaurus joins Neovenator, and Guanlong and Tanycolagreus become maniraptoromorphs. 18 steps- Basal paravian Archaeopteryx. Deinonychosauria forms, and anchiornithids and scansoriopterygids are further from Eumaniraptora. 19 steps- Coelophysoid ornithischians or ornithischians sister to Neotheropoda, as in Baron (2017). Chilesaurus is the most basal theropod. 19 steps- Basal deinonychosaur Archaeopteryx, as in Xu et al. (2011). Anchiornis, Aurornis and Serikornis are one node closer to Dromaeosauridae plus Troodontidae. 20 steps- Monolophosaurus sister to Guanlong, as in Carr (2006) who proposed they were an adult and juvenile of the same species. The pairing resolves as sister to Tyrannoraptora. 21 steps- Carnosaurian megaraptorans. Er, wow. The Carrano et al. consensus is blown out of the water. They don't even group with Neovenator, instead (including Gualicho and Bicentenaria) being in a trichotomy with megalosaurids and an Allosauroidea including piatnitzkysaurids. 22 steps- Theropodan Marasuchus, as in Olshevsky (1991). Silesaurids, Eoraptor+Buriolestes and herrerasaurians are also theropods. 23 steps- Avialan therizinosaurs, as in Maryanska et al. (2002). One of the odder parts of the classic 'oviraptorosaurs are birds' analysis is that they recovered therizinosaurs as closer to birds than dromaeosaurids or troodontids, which was only briefly mentioned in the text, while they removed Troodontidae and Therizinosauria from their figured cladogram. 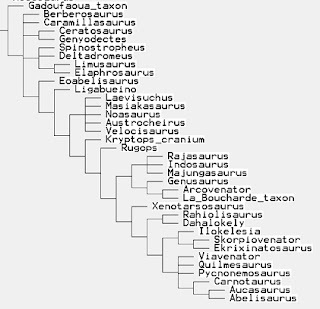 Constraining this result leads to oviraptorosaurs being dragged along, and the whole of Caenagnathiformes is sister to taxa closer to Aves like scansoriopterygids, anchiornithids, Archaeopteryx, etc..
24 steps- 'Allosaur' Ornitholestes, as in Paul (1988). Although Paul includes Ornitholestes in his Allosauridae, he views that family as paraphyletic to tyrannosaurids and his figure 10-1 shows Allosaurus closer to tyrannosaurids than Ornitholestes. I thus only specified Ornitholestes to be closer to Allosaurus than megalosaurids, piatnitzkysaurids, Compsognathus and birds. The resulting tree has ornitholestiids (including Zuolong) sister to core allosauroids including Monolophosaurus (which was considered closer to Allosaurus by Paul too- pg. 307), but tyrannosauroids and compsognathids are coelurosaurs. 24 steps- Ornithuran (sensu Gauthier) alvarezsaurids. The most crownward alvarezsaurids were ever proposed to be, closer to Aves than Archaeopteryx. They end up just crownward of anchiornithids, and weirdly form a clade there with scansoriopterygids and oviraptorosaurs. As usual, the absence of parvicursorines probably affects the numbers. 24 steps- Archaeopterygid Protarchaeopteryx, as in Paul (2002). Xiaotingia and scansoriopterygids are also closer to Archaeopteryx than Aves in these trees. 25 steps- Tyrannosauroids sister to Pennaraptora, as in Sereno (1999). Like Sereno's trees, alvarezsauroids and therizinosaurs (Beipiaosaurus) form an expanded Arctometatarsalia, though now joined by Ornitholestes, Aorun and Compsognathus. Coelurus becomes a tyrannosauroid. 26 steps- Ornithischian alvarezsaurids, as in Alifanov and Barsbold (2009). Chilesaurus emerges as an alvarezsauroid. Note the true number is probably much higher since neither included alvarezsaurid has cranial material. 30 steps- Ceratosaurian ornithomimosaurs, as in my half-joking post. They don't even come out by Limusaurus or Elaphrosaurus, instead Ornithomimosauria (including Zuolong and Gualicho) are sister to other ceratosaurs. How disappointing. 35 steps- Sauropodomorphan Beipiaosaurus. Falcarius stays by oviraptorosaurs, while Beipiaosaurus ends up sister to Guaibasaurus. 35 steps- Phytodinosaurian Beipiaosaurus. Falcarius stays by oviraptorosaurs, while Beipiaosaurus is sister to Chilesaurus as an ornithischian. 36 steps- Ornithomimosaurian Elaphrosaurus. Gualicho follows, and ornithomimosaurs move stemward to be sister to Tyrannoraptora. 36 steps- Megalosaurid abelisauroids, as in Paul (1988). Megalosaurus moves to Abelisauria. 36 steps- Dromaeosaurid Ornitholestes, as in Makovicky (1995). Fukuivenator emerges as the most basal dromaeosaurid, and dromaeosaurids are the most basal pennaraptorans with oviraptorosaurs, scansoriopterygids, anchiornithids and troodontids successively closer to birds. This is equivalent to my old post about getting dromaeosaurid evolution backwards. 37 steps- Bullatosauria. This actually moves ornithomimosaurs plus alvarezsauroids into Avialae to be sister to troodontids. I had to specify both Zanabazar and Sinornithoides as troodontids, because specifying Zanabazar alone moves it into Ornithomimosauria without the other troodontids at a lower cost of 21 steps. 37 steps- Oviraptorosaurian Sapeornis, as in Paul (2010). Oviraptorosaurs move to just closer to Aves than Archaeopteryx, with scansoriopterygids closer to core oviraptorosaurs than Sapeornis. 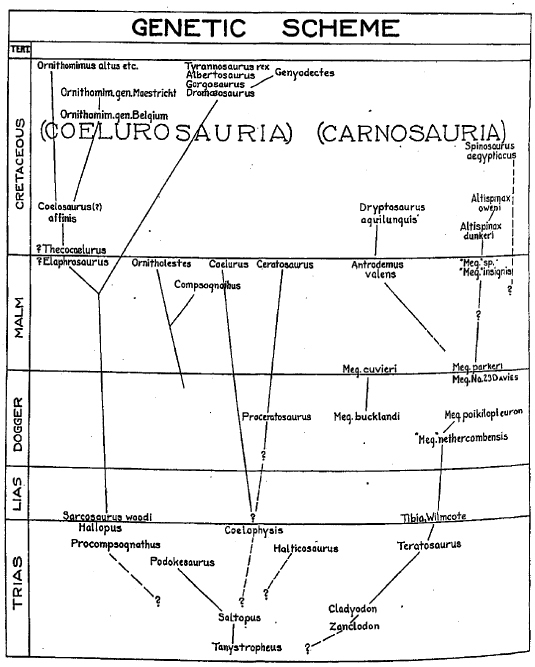 Phylogram from Huene (1923) showing his idea of what were carnosaurs vs. coelurosaurs. 39 steps- Huene's (1923) Carnosauria vs. Coelurosauria dichotomy. For such an archaic concept, this works surprisingly well. The trick is that Huene's and Cau's Carnosauria are basically the same. By 1923, Huene had moved Ceratosaurus to Coelurosauria and placed tyrannosaurids and Elaphrosaurus there as well. His carnosaurs are Megalosaurus, Eustreptospondylus and Allosaurus. Even looking at the taxa not included in Cau's analysis, most shake out right- coelurosaurian Sarcosaurus, Halticosaurus, Procompsognathus, Podokesaurus, Betasuchus, Genyodectes, Proceratosaurus and Thecocoelurus vs. carnosaurian Magnosaurus, Poekilopleuron, Spinosaurus and Metriacanthosaurus. There's a load of non-theropods in there and Huene got Sarcosaurus? andrewsi, Dryptosaurus and Valdoraptor wrong, but still impressive. So this basically how many steps it takes to force carnosaurs stemward of Ceratosauria sensu lato. 43 steps- Sauriurine enantiornithines, as in Martin (1983). Basically constraining enantiornithines (Bohaiornis and Cruralispennia here) as closer to Archaeopteryx than to Aves. Rahonavis and Balaur emerge as sauriurines, but surprisingly scansoriopterygids, Sapeornis, jeholornithids, Confuciusornis, Zhongjianornis and Protopteryx remain as closer to Aves ('Ornithurae' in BANDit terminology). 57 steps- Sauriurine enantiornithines and Confuciusornis, as in Hou et al. (1995). This is more in line with BANDit thought, as not only enantiornithines, Archaeopteryx and Confuciusornis fall out as sauriurines, but also Protopteryx, Sapeornis, jeholornithids (Martin, 2004), Vorona (Kurochkin, 2006), Rahonavis and Xiaotingia (those two as archaeopterygids). Unlike the plus 43 step tree, scansoriopterygids are outside Sauriurae plus 'Ornithurae' similar to Czerkas' hypothesis. 58 steps- Abelisaurid Piatnitzkysaurus, as in Currie and Zhao (1994). Condorraptor follows, Eoabelisaurus also becomes an abelisaurid. 75 steps- 'Carnosauria' vs. 'Oviraptorosauria' of Russell and Dong (1994). The Alxasaurus description is my most nostalgic technical paper, because it was the first I tracked down that wasn't in Science or Nature. The authors presented a strange new analysis of theropods, where tetanurines fell into 'Carnosauria' (Baryonyx, Yangchuanosaurus, Allosaurus, dromaeosaurids and tyrannosaurids in successive order) and 'Oviraptorosauria' (ornithomimosaurs, therizinosauroids, oviraptorosaurs and troodontids in successive order). Needless to say, it doesn't hold up, even when topology within each clade is allowed to vary like it is here. Birds end up in 'Oviraptorosauria', so that would be Coelurosauria under current nomenclature. 78 steps- "Pneumatocrania", Holtz's (1994) concept combining oviraptorids, 'elmisaurids', tyrannosaurids, troodontids and ornithomimosaurs to the exclusion of dromaeosaurids and birds. Cau's matrix doesn't result in anything close to Holtz's topology for this clade, with troodontids sister to oviraptorosaurs (including scansoriopterygids), and ornithomimosaurs sister to tyrannosauroids with alvarezsauroids and therizinosaurs in a trichotomy with Tyrann+Ornithom. As with Bullatosauria, Sinornithoides had to be specified as well. 81 steps- Arctometatarsalia sensu Holtz (1994). This is like "Pneumatocrania" except it excludes oviraptorids. In Cau's analysis, this results in most oviraptorosaurs (including scansoriopterygids) being maniraptorans, but 'elmisaurid' Anzu being sister to Zanabazar deep within Troodontidae. Again unlike Holtz's topology, tyrannosauroids, ornithomimosaurs, alvarezsauroids, therizinosaurians and Fukuivenator are successively closer to troodontids. 84 steps- Huene's Pachypodosauria, where his carnosaurs are closer to sauropodomorphs than his coelurosaurs. Pachypodosauria ends up containing sauropodomorphs and ceratosaurs plus Cau's expanded Carnosauria, with every other theropod a coelurosaur. [Edit] 100 steps- Conservative BANDit topology. Here I specified taxa with stage III or IV feathers as birds, and retained Heterodontosaurus, Plateosaurus, Herrerasaurus, Coelophysis, Majungasaurus, Megalosaurus, Allosaurus and Sinosauropteryx as dinosaurs theropods. Forcing birds outside Saurischia, Dinosauria, Dracohors, Dinosauriformes, etc. is difficult as it is actually easier to get Teleocrater up in basal Coelurosauria than to break up those clades. But just breaking up Theropoda into these two clades takes 83 steps. Tyrannosauroids, ornithomimosaurs, alvarezsauroids and therizinosaurs group with birds. 140 steps- Coelophysoid birds, as in Raath (1985). Other theropods known at the time were constrained as monophyletic relative to a Coelophysoidea containing rhodesiensis, Archaeopteryx, Hesperornis, Ichthyornis and Meleagris. Bicentenaria, Fukuivenator, halszkaraptorids, scansoriopterygids and paraphyletic anchiornithids end up bridging the gap between coelophysoids and birds. 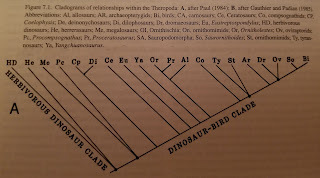 Paul's (1984) cladogram of predatory dinosaurs, after Raath (1990). 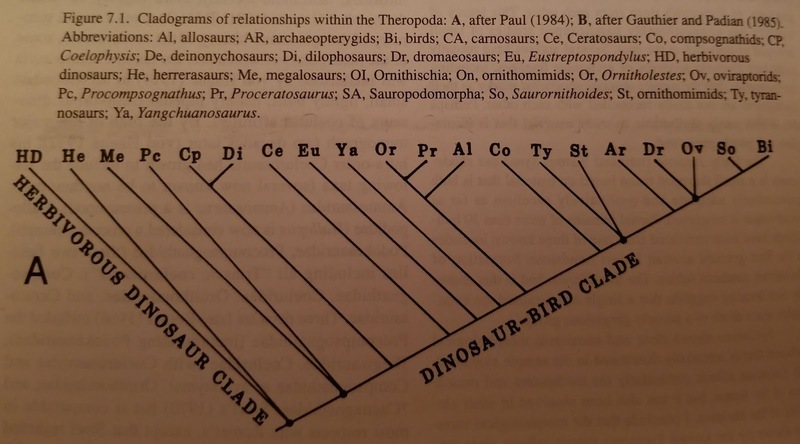 It differs from Paul's actual printed cladogram where compsognathids are better interpreted as in an unresolved trichotomy between 'allosaurs' and other coelurosaurs, ornithomimids merely extend with a '?' falling between tyrannosaurids and Archaeopteryx, and oviraptorids extend with a '?' that falls on the troodontid plus bird branch. Note this differs from the PDW phylogeny in that megalosaurids are down by Procompsognathus and tyrannosaurids are sister to Protoavia. 191+ steps- Kurochkin's (2006) diphyletic birds. BANDit Kurochkin had a weird hypothesis that Archaeopteryx and enantiornithines were theropods, but Confuciusornis, Patagopteryx, Ichthyornis, Hesperornis and of course Aves are birds. These diverged at the typically vague BANDit level of Archosauromorpha or Archosauria, with no comment on where crocodylians, ornithischians, sauropodomorphs, etc. go. It's again very hard to constrain in TNT since the program doesn't let the outgroup (Euparkeria) be specified, so if you constrain the next closest taxon (Teleocrater) to be outside of dinosauromorphs on one side and 'Ornithurae' on another, it's more parsimonious for TNT to force Teleocrater into Ornithothorces than to make that basal divergence. But even a weak version of Kurochkin's hypothesis where Coelophysis and Allosaurus are still theropods and lead to enantiornithines but are more closely related to 'Ornithurae' than Teleocrater, Lagerpeton, Marasuchus, Heterodontosaurus and Plateosaurus results in 191 more steps. Fukuivenator, halszkaraptorids, scansoriopterygids, Balaur and Zhongjianornis end up on the 'ornithurine' line. Ignoring maniraptoromorphs (so as not to hint at Lori's topology) I'm most surprised by the robusticity of Cau's expanded Carnosauria, the rootward mobility of compsognathid-grade taxa, how unparsimonious carnosaurian megaraptorans are, and how parsimonious ceratosaurian megalosaurids and arctometatarsalian tyrannosaurids are. I think Gualicho is the most interesting theropod right now in terms of just what it is, since its remains are decent but it can pretty easily move between ceratosaurs, tyrannosauroids and ornithomimosaurs. Bicentenaria also finds its way into a suprisingly large number of hypotheses, so deserves a more detailed description. References- Huene, 1923. Carnivorous Saurischia in Europe since the Triassic. Bulletin of the Geological Society of America. 34, 449-458. Martin, 1983. The origin and early radiation of birds. in Brush and Clark, (eds.). Perspectives in Ornithology. 291-338. Paul, 1984. 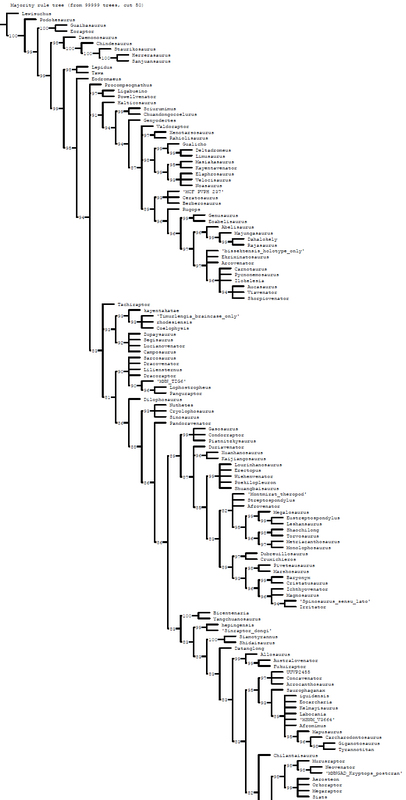 The archosaurs: A phylogenetic study. In Reif and Westphal (eds.). Third Symposium on Mesozoic Terrestrial Ecosystems, Short Papers. 175-180. Raath, 1985. The theropod Syntarsus and its bearing on the origin of birds. In Hecht, Ostrom, Viohl and Wellnhofer (eds.). The Beginnings of Birds. Freunde des Jura-Museums Eichstätt, Eichstätt. 219-227. Bakker, Williams and Currie, 1988. Nanotyrannus, a new genus of pygmy tyrannosaur, from the latest Cretaceous of Montana. Hunteria. 1, 1-30. Paul, 1988. Predatory Dinosaurs of the World. Simon & Schuster, New York. 464 pp. Raath, 1990. Morphological variation in small theropods and its meaning in systematics: Evidence from Syntarsus rhodesiensis. In Carpenter and Currie (eds.). Dinosaur Systematics: Approaches and Perspectives. Cambridge University Press, Cambridge. 91-105. Britt, 1991. Theropods of Dry Mesa Quarry (Morrison Formation, Late Jurassic), Colorado, with emphasis on the osteology of Torvosaurus tanneri. Brigham Young University Geology Studies. 37, 1-72. Novas, 1992. La evolucion de los dinosaurios carnivoros. In Sanz and Buscalioni (eds.). Los Dinosaurios y Su Entorno Biotico: Actas del Segundo Curso de Paleontologia in Cuenca. Instituto "Juan Valdez", Cuenca, Argentina. 126-163. Currie and Zhao, 1994. A new carnosaur (Dinosauria, Theropoda) from the Jurassic of Xinjiang, People's Republic of China. Canadian Journal of Earth Sciences. 30(10), 2037-2081. Russell and Dong, 1994. 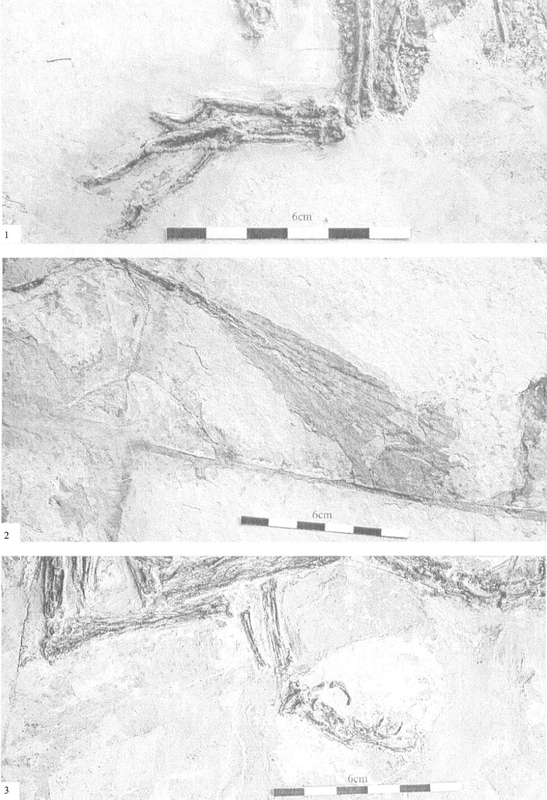 The affinities of a new theropod from the Alxa Desert, Inner Mongolia, People’s Republic of China. Canadian Journal of Earth Sciences. 30(10), 2107-2127. Currie, 1995. 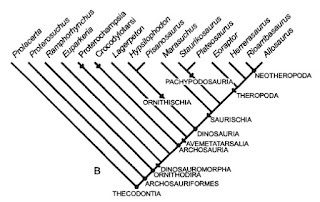 Phylogeny and systematics of theropods (Dinosauria). Journal of Vertebrate Paleontology. 15(3, 25A. Hou, Zhou, Gu and Zhang, 1995. 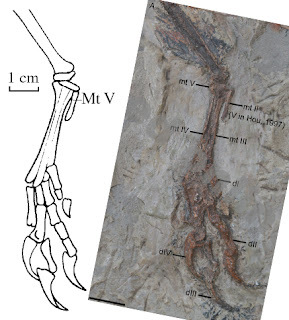 Confuciusornis sanctus, a new Late Jurassic sauriurine bird from China. Chinese Science Bulletin. 40(18), 1545-1551. Forster, Sampson, Chiappe and Krause, 1998. The theropod ancestry of birds: New evidence from the Late Cretaceous of Madagascar. Science. 279, 1915-1919. Sereno, 1999. The evolution of dinosaurs. Science. 284, 2137-2147. Holtz, 2000. 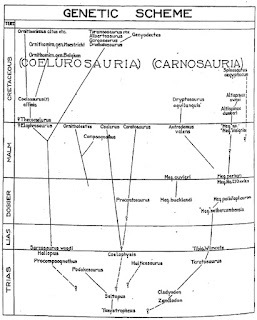 A new phylogeny of the carnivorous dinosaurs. GAIA. 15, 5-61. Kischlat, 2000. Tecodoncios: A aurora dos Arcosaurios no Triassico. in Holz and De Rose (eds.). Paleontologia do Rio Grande do Sul. 273-316. Longrich, 2002. Systematics of Sinosauropteryx. Journal of Vertebrate Paleontology. 22(3), 80A. Maryanska, Osmolska and Wolsan, 2002. Avialan status for Oviraptorosauria. Acta Palaeontologica Polonica. 47(1), 97-116. Paul, 2002. Dinosaurs of the Air. The Johns Hopkins University Press, Baltimore. 460 pp. Rauhut, 2003. The interrelationships and evolution of basal theropod dinosaurs. Special Papers in Palaeontology. 69, 1-213. Carr, 2006. Is Guanlong a tyrannosauroid or a subadult Monolophosaurus? Journal of Vertebrate Paleontology. 26(3), 48A. Kurochkin, 2006. Parallel evolution of theropod dinosaurs and birds. Entomological Review. 86 (Supp. 1), S45-S58. Alifanov and Barsbold, 2009. Ceratonykus oculatus gen. et sp. nov., a new dinosaur (?Theropoda, Alvarezsauria) from the Late Cretaceous of Mongolia. Paleontological Journal. 43(1), 94-106. Lee and Worthy, 2011. Likelihood reinstates Archaeopteryx as a primitive bird. Biology Letters. 8(2), 299-303. Xu, You, Du and Han, 2011. An Archaeopteryx-like theropod from China and the origin of Avialae. Nature. 475, 465-470. Senter, Kirkland, DeBlieux, Madsen and Toth, 2012. New dromaeosaurids (Dinosauria: Theropoda) from the Lower Cretaceous of Utah, and the evolution of the dromaeosaurid tail. PLoS ONE. 7(5), e36790. Agnolin and Novas, 2013. Avian ancestors: A review of the phylogenetic relationships of the theropods Unenlagiidae, Microraptoria, Anchiornis and Scansoriopterygidae. Springer Netherlands. 96 pp. Novas, Agnolin, Ezcurra, Porfiri and Canale, 2013. Evolution of the carnivorous dinosaurs during the Cretaceous: The evidence from Patagonia. Cretaceous Research. 45, 174-215. Foth, Tischlinger and Rauhut, 2014. New specimen of Archaeopteryx provides insights into the evolution of pennaceous feathers. Nature. 511, 79-82. Cau, 2018. The assembly of the avian body plan: A 160-million-year long process. Bollettino della Società Paleontologica Italiana. 57(1), 1-25. Hi all. Work's been rapid on the Ornithoscelida project, which has improved due to David Marjanovic's request that I provide a citation for each character state we think was inaccurately coded by Baron et al.. It's time consuming, but has revealed several times where I was mistaken in my scoring, and forces you to really evaluate whether you think the evidence is good enough to truly call someone's character state choice wrong. As tedious as it is, this should really become the standard for scoring justification in any analysis (and no, I didn't do that for the Lori analysis, though I have the preliminary steps for a far future offshoot of it). Speaking of the Ornithoscelida paper, coauthor and fellow theropod blogger Andrea Cau just got a big new paper published using his MegaMatrix character list. So congrats! It's a summary of theropod evolution focusing on the path from Teleocrater to Meleagris, detailing the changes in each node from Pan-Aves (well, technically that's a stem) to Aves, and using that data to examine the trends and rates of change along that line. We get two new clade names as well. Dracohors is (Megalosaurus bucklandii < - Marasuchus lilloensis), so covers silesaurs and dinosaurs. The use of a stem instead of a node like Silesaurus+Megalosaurus was wise considering some analyses (especially those recovering ornithischian silesaurids) recover Lewisuchus and such at an uncertain position relative to Silesauridae, but it's always closer to dinosaurs than Marasuchus. But come on, 'Dracohors'? Dragonian prostitutes? Did no one learn from Ascendonanus?! Oh, and the plural is 'dracohorsians', which sounds like a hybrid race from My Little Pony. Maniraptoromorpha is (Vultur gryphus < - Tyrannosaurus rex) and is a sorely needed name that I could have used in the Lori paper, since we ended up limiting the taxon sample to maniraptoromorphs. Recall that the results of TWG characters get worse as you get further from Norell et al. 's (2001) or Clarke's (2002) original scopes, and I didn't want to be Petersian and tackle e.g. the Megaraptora problem without the Carrano et al. (2012) or Novas et al. (2013) characters while using a batch of maniraptoromorph characters. The name Maniraptoromorpha also fits the -morpha > -formes > basic clade pattern, which I like. Sacrum of the maniraptoromorph Bambiraptor feinbergi (holotype AMNH 30556) in ventral view, anterior to left (courtesy of the AMNH). 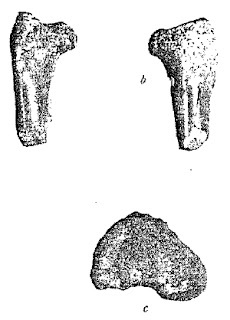 1717): Premaxilla, sixth alveolus: absent (0); present (1). 1718): Premaxilla, seventh alveolus: absent (0); present (1). 1759): Premaxilla, fourth alveolus: absent (0); present (1)." 1707): Fourth sacral vertebra: absent (0); present (1). 1708): Fifth sacral vertebra: absent (0); present (1). 1709): Sixth sacral vertebra: absent (0); present (1). 1710): Seventh sacral vertebra: absent (0); present (1). 1711): Eight sacral vertebra: absent (0); present (1). 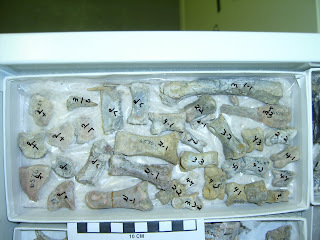 1712): Ninth sacral vertebra: absent (0); present (1). 1713): Tenth sacral vertebra: absent (0); present (1). 1714): Eleventh sacral vertebra: absent (0); present (1)." It also doesn't use any polymorphic scoring, so there are no 0+1 scores in Cau's matrix. I'm not sure if this matters analytically, since I assume he scores a polymorphic taxon unknown, and I don't know how TNT treats polymorphies when it's making trees. Not that the standard method is without its problems, since TNT is stupider than PAUP in treating uncertainty polymorphies (could have either four or five teeth) the same as actual polymorphies (some have four teeth, others five). He also doesn't differentiate inapplicable (-) and unknown (?) scorings, which is fine functionally as I believe TNT treats them the same, but this and the lack of polymorphic scores do make the matrix itself more opaque to users since a lot of question marks there aren't technically unknown. For the Lori matrix, we're providing both a TNT and a NEXUS file, with the latter showing uncertainty polymorphies vs. actual polymorphies, plus when taxa can but shouldn't be scored due to ontogeny (e.g. a juvenile with unfused bones, when adults are unknown). 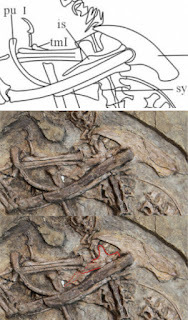 Cranial elements of the maniraptoromorph Microvenator celer (holotype AMNH 3041), with supposed right lacrimal of Makovicky and Sues in lateral view (upper left, anterior to right), dentary in dorsal view (lower right, anterior to top) and unidentified elements (scale bar in cm) (courtesy of the AMNH). The taxon sample is interesting because it is very reduced compared to the Halszkaraptor analysis (Cau et al., 2017) that used the same character list (plus eight new characters; though among maniraptoromorphs, Jianianhualong and Chongmingia were added). Alvarezsaurids are only represented by Alvarezsaurus and Patagonykus, caenagnathoids by Anzu and Khaan, therizinosaurs by Beipiaosaurus and Falcarius (and Jianchangosaurus... see below), etc.. Which still leaves it as the best large scale Mesozoic theropod analysis published, but without e.g. undisputed alvarezsaur skulls (since Haplocheirus finds itself elsewhere in some analyses), it's bound to get things wrong. And it does differ from Cau et al. 's 2017 trees which focused on maniraptoromorphs. Zuolong is outside Neotetanurae instead of a coelurosaur, Coelurus is a maniraptoromorph [see how useful this clade name is!] instead of a tyrannosauroid, Jianchangosaurus is an alvarezsaur(! ), therizinosaurs are caenagnathiforms instead of outside Pennaraptora, Fukuivenator is a paravian instead of a therizinosaur, halszkaraptorines are unenlagiines, Xiaotingia is a scansoriopterygid instead of an anchiornithid, scansoriopterygids are further from Aves than Archaeopteryx, and Zhongjianornis is in Fake Ornithuromorpha instead of sister to Pygostylia. Cau states on page 4 that taxon choice was based on a subjective (or at least not objectively justified) "balanced series of criteria" and I get that the point of the paper is trends leading to Aves, but having the quite complete Jianchangosaurus as the first branching of four alvarezsaurs, and eliminating a major step by placing therizinosaurs sister to oviraptorosaurs, seem like problems. I'm sure the main trends are only very minorly affected, but still. I think if I needed a reduced taxon sample (which was a real concern during part of the Lori process...) and was being subjective anyway, I would fiddle with the sample until I got a topology that matched the full analysis. Or maybe Jianianhualong, Chongmingia and/or the added eight characters changed the topology, and this whole paragraph is misled. 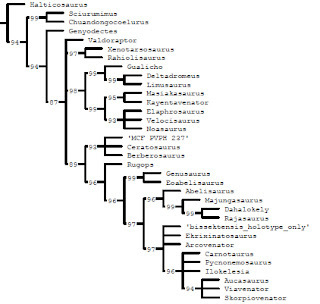 Or maybe the reduced outgroup in the Halszkaraptor matrix affected the topology (only eight non-maniraptoromorphs compared to 58 here), which would be problematic for coelurosaur analyses since most have just been using 2-5 of the same outgroup taxa (Sinraptor dongi, Allosaurus, Monolophosaurus, Dilophosaurus, and/or Coelophysis...)..
Parsimony-based strict consensus of Cau (2018)with clade names along the bird lineage and Decay Indices > 1 (after Cau, 2018). What of the phylogenetic results themselves? 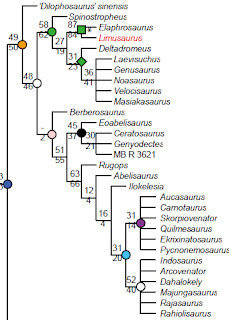 Eodromaeus and herrerasaurs are in an unresolved polytomy with sauropodomorphs and ornithoscelidans, which matches their increasingly uncertain position now that people are using large taxon samples for more than Nesbitt-derived matrices and Sereno's non-testing 'analyses' from the 90s are fading into history. Ornithoscelida itself is recovered, but with only Heterodontosaurus and Tianyulong representing Ornithischia, I don't give that much credit regardless of the character count. 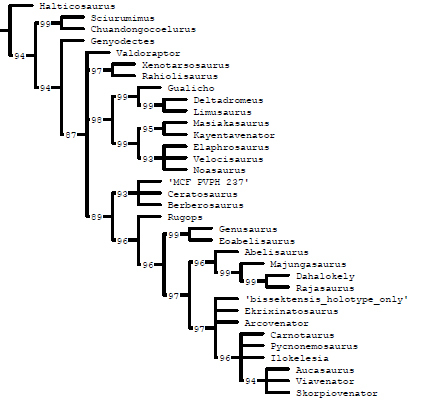 Heterodontosaurids are very theropody in some ways few other ornithischians are and generally fall out as the first branching clade in analyses (now that Pisanosaurus is a silesaurid, which Cau also recovers) and ignoring Chilesaurus for the moment. But I'm co-writing a whole paper on that, so let's move on to theropods. Cryolophosaurus is a dilophosaurid coelophysoid, which is counter the recent consensus of finding it closer to averostrans or even a tetanurine itself. As stated above, Zuolong is outside Neotetanurae, which is weird since it generally falls out as a basal coelurosaur. Chilesaurus is also here, matching its authors' conclusion, but I think the poor ornithischian sample keeps this analysis from adequately dismissing an ornithischian identity. But I'm co-writing a paper on that and etc. etc.. Back to theropods. Cau recovers a Rauhut-like Carnosauria including megalosaurids, piatnitzkysaurids, Monolophosaurus and allosaurs. Neovenator is sister to Allosaurus and Sinraptor sister to Acrocanthosaurus among the latter, which harkens back to late 90s phylogenies. Megaraptorans (including Gualicho) are tyrannosauroids closer to Tyrannosaurus than Eotyrannus, matching Novas et al. (2013). The tree is untraditional in placing compsognathid-grade taxa outside Tyrannoraptora, though Novas had that opinion back in the early 1990s. As stated above, the maniraptoran section has the out of vogue caenagnathiform therizinosaurs and the very weird alvarezsauroid Jianchangosaurus, but those might be glitches due to the taxon sample. Fukuivenator is sometimes a dromaeosaurid and sometimes the basalmost paravian, which its authors recovered with the addition of three steps. Cau finds avialan troodontids, standard for his published analyses. Like his Halszkaraptor version, Rahonavis is close to jeholornithids and Protopteryx can be outside Ornithothoraces (it always is in the 2017 trees). The latter is funny because I had that idea way back in 2000 on the DML ("My analysis of 31 characters and 6 taxa resulted in a single most parsimonious teee (CI .81, HI .19, RI .78)" ... how quaint), so if it turns out to be true that would be something. Finally, presumably due to excluding fragmentary taxa like Teviornis, the huge ornithuromorph polytomy of the 2017 paper is resolved and Patagopteryx falls out by Apsaravis, Ichthyornis and Hesperornis+Aves. Wha? Interestingly, Cau also performed a Bayesian analysis. In these, herrerasaurs are sister to Dinosauria like Baron and Williams (2018), but Eodromaeus is a basal ornithoscelidan. 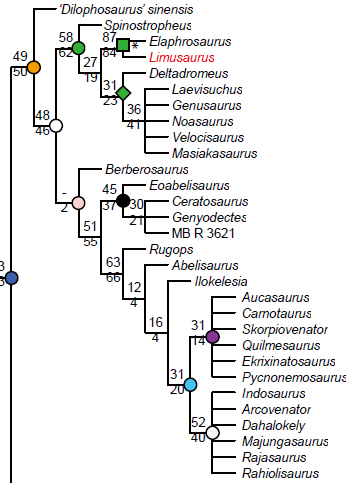 Allosauroid relationships now match the Carrano et al. consensus, and Zuolong is a basal coelurosaur but Chilesaurus follows it. Gualicho is now closer to tyrannosaurids than to megaraptorans. Jianchangosaurus is back to being a therizinosaur, but Ornitholestes and Haplocheirus are basal ornithomimosaurs. Weird. Therizinosaurs are no longer sister to oviraptorosaurs, and actually move down an extra node to be stemward of alvarezsaurids too. Especially interesting is that scansoriopterygids move way down from being avialans to being basal oviraptorosaurs. Are they the missing Jurassic oviraptorosaurs? This lets Xiaotingia go back to Anchiornithidae. Rahonavis is now sister to Jeholornithidae instead of a couple nodes stemward of it, and Sapeornis is a confuciusornithiform. Protopteryx is always an enantiornithine (aw...), but Patagopteryx is still way crownward, though now Vorona joins it (basal fake ornithuromorph in the parsimony analysis). Well, that does match their Late Cretaceous age at least. Considering all of these changes, I like a few things better about the parsimony version and a few things better about the Bayesian version. How does Cau's Maniraptoromorpha topology compare to Lori's? Quite different on both a broad level and with regard to the detailed relationships within the clades, although there are a few things that aren't common but popped up in both. I'm dying to say more, but that post has got to wait. Congrats again to Andrea. References- Norell, Clark and Makovicky, 2001. 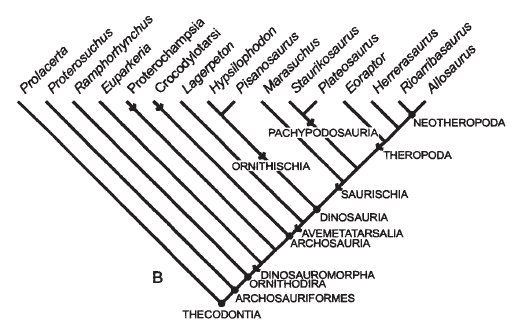 Phylogenetic relationships among coelurosaurian theropods. In Gauthier and Gall (eds.). New Perspectives on the Origin and Early Evolution of Birds: Proceedings of the International Symposium in Honor of John H. Ostrom. 49-67. Clarke, 2002. 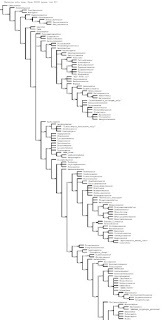 The morphology and systematic position of Ichthyornis Marsh and the phylogenetic relationships of basal Ornithurae. PhD thesis, Yale University. 532 pp. Livezey and Zusi, 2007. Higher-order phylogeny of modern birds (Theropoda, Aves: Neornithes) based on comparative anatomy. II. Analysis and discussion. Zoological Journal of the Linnean Society. 149. 1-95. Cau, Beyrand, Voeten, Fernandez, Tafforeau, Stein, Barsbold, Tsogtbaatar, Currie and Godefroit, 2017. Synchrotron scanning reveals amphibious ecomorphology in a new clade of bird-like dinosaurs. Nature. 552, 395-399. Baron and Williams, 2018. A re-evaluation of the enigmatic dinosauriform Caseosaurus crosbyensis from the Late Triassic of Texas, USA and its implications for early dinosaur evolution. Acta Palaeontologica Polonica. 63(1), 129-145.